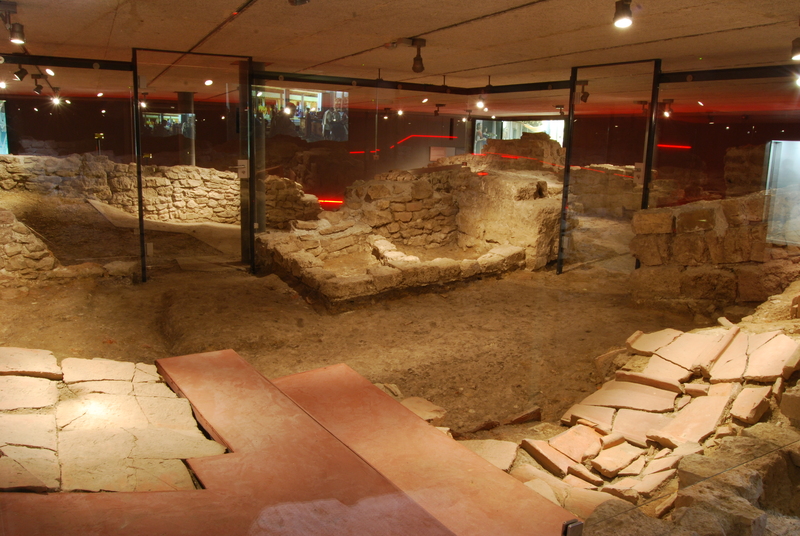 Vindonissa is the only Roman legionary camp situated in modern-day Switzerland. The site commands a topographically and logistically advantageous position on the Swiss Plateau, a geographical region bordered by the high Alps and Italian provinces to the south and the wide arc of the Jura mountains to the north. 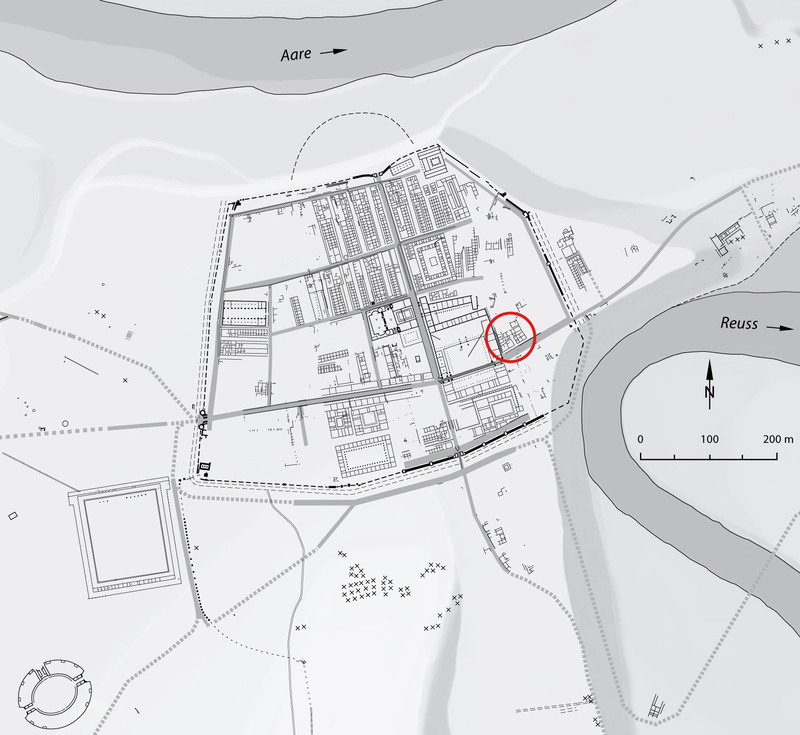 Around AD 14, the first legionary camp was erected by the 13th Legion (legio XIII gemina) on a spur of land that had been occupied and fortified since the Late Celtic period. During the course of the first century AD, Vindonissa served as the base for the 21st (legio XXI rapax) and the 11th (legio XI claudia pia fidelis) legions. The periods of occupation for the different troops can be identified in the archaeological record. Most recently, the civil settlements (canabae legionis/vicus), located outside the camp gates, have been also studied intensively. The 11th legion left the camp ca. AD 101. Finds and structures from the subsequent period, the so-called “Nachlagerzeit,” show that the site continued to be occupied. To date, the Late Antique Castrum Vindonissense has been subject to little research. It is a complex in the classical style of an “enceinte reduite,” which was erected in the early fourth century AD and remained standing until the early fifth century — until the military general (magister utriusque militiae) Flavius Stilicho finally withdrew troops from the regions north of the Alps. In the year 2002, triggered by a building project, an area of 900m2 — located right next to the camp’s principia — was subject to an archaeological investigation. With regard to the camp’s architecture in the first century AD, the area in question was terra incognita. Conversely, the excavation site’s position within the Late Celtic topography of Vindonissa was well documented, as it lay in line with the pre-Roman fortification, the so-called “Keltengraben” (a rampart-ditch system with a so-called “Pfostenschlitzmauer” — “post-slot wall”). The excellent perseveration of the first-century archaeological structures can be directly connected to the “Keltengraben”. In the the Early Imperial Period, the Romans back-filled the 20 m.-wide, 7 m.-deep ditch, and that fill was strongly interspersed with organic remains. Over the course of the Roman period and beyond, these organic remains began to dissolve. Buildings erected over the ditch thus sank down locally, were consequently protected from later destruction, and their walls were preserved up to the level of rising masonry. The extant building was erected over a predecessor that dated to the middle of the first century AD. Its layout is trapezoidal; it borders the east side of the principia, separated only by a narrow alleyway. The southern façade faces the via principalis, one of the two main camp streets. Behind a narrow porticus is located a series of rooms, mostly equipped with small fireplaces. These rooms can be interpreted as tabernae. About half of the house’s floor plan was excavated. 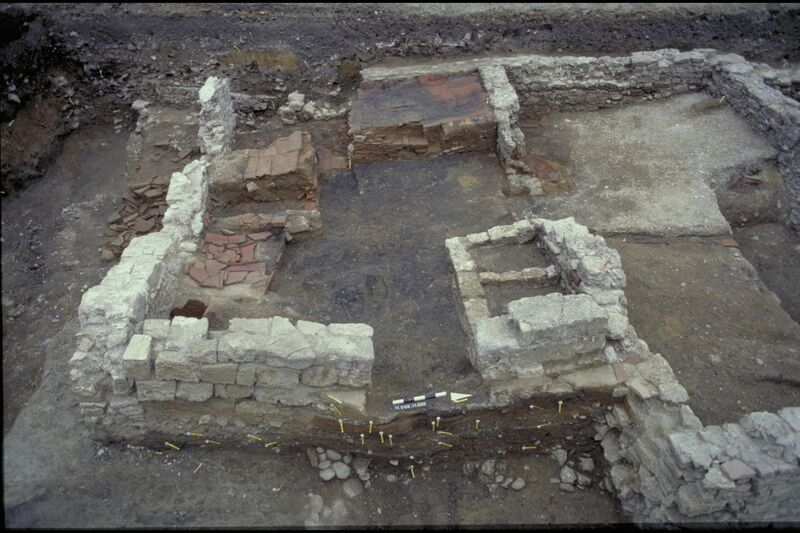 The room and measurement plan is well known and can be compared to the tribune’s quarters, excavated at an earlier date and belonging to the same scamnum (scamnum tribunorum, the ‘officer’s quarter’). 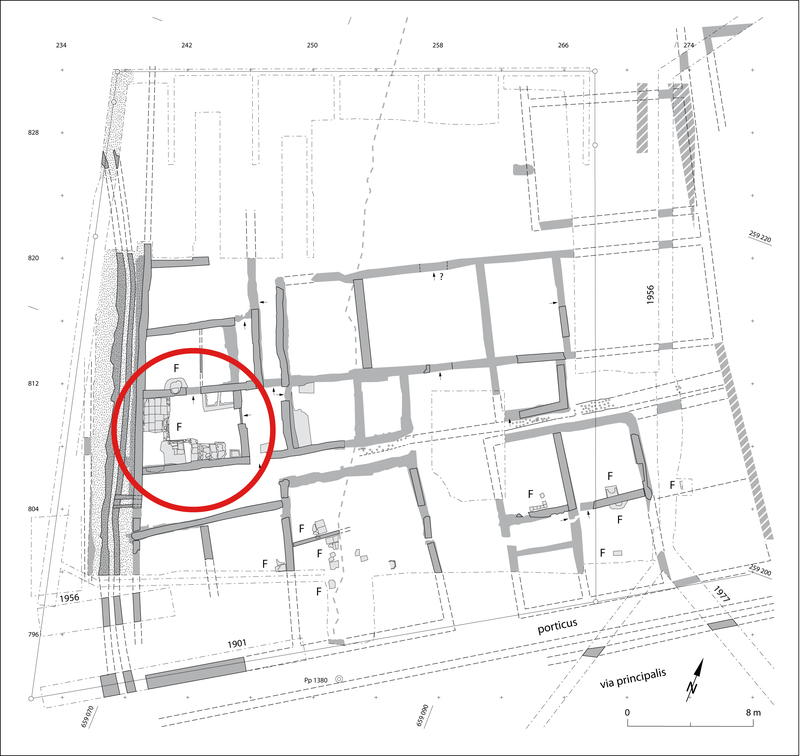 The building’s identification as a peristyle house by the then-excavator Thomas Pauli-Gabi is definitely correct and well-founded. Even if it cannot be definitely proved, there is the possibility that this building was the seat of the first centurion of the camp (primus pilus). What we can say is that here — directly next to the administrative and religious centre of the camp — was the residence of a high-ranking officer. “…various installations and a blackened floor coming from charcoal, ash and carbonised food remains were all excellently preserved. The room, around 26 m.2 in size, was accessed by a 1 m. wide entry, which in turn was joined to a kind of vestibule. To the right of the door, a double-chambered installation of unknown function was situated. A cist made of roof tiles, set into the floor, was located in the opposite corner, in which a mortar of light fabric had been left (see below). 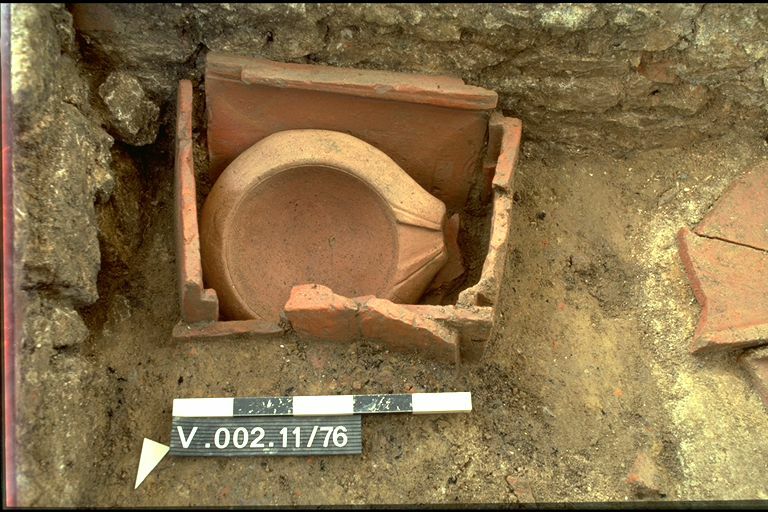 A large amount of kitchen utensils was found in the form of kitchen ceramics. However, further metal apparatus such as grill racks, bronze vessels or skewers were missing completely. The most plausible explanation for this biased finds ensemble would be that the inhabitants took their valuable metal equipment with them when they left in AD 101.” (Thomas Pauli-Gabi 2005, 31-32). To date, the large kitchen in the peristyle house located in the centre of the legionary camp of Vindonissa is unique within the northwest provinces. Furthermore, it is considerably larger than those known from Pompeii and Herculaneum. The scientific investigation that has now started will hopefully yield new insights into the construction history, function, and equipment of the culina. The soil samples, which, thanks to careful excavation and documentation can be stratified, will be analysed in complementary investigations. Detailed information about food products used here in the second half of the first century AD will be gleaned from the zoological and botanical remains in the occupation strata. Publication of the research results has been scheduled in the “Gesellschaft Pro Vindonissa” series for 2016. The current investigation will not solely focus on the kitchen, but also on the pre-Roman fortification (the “Keltengraben”), and on the period after the legions departed from the second century AD onwards. 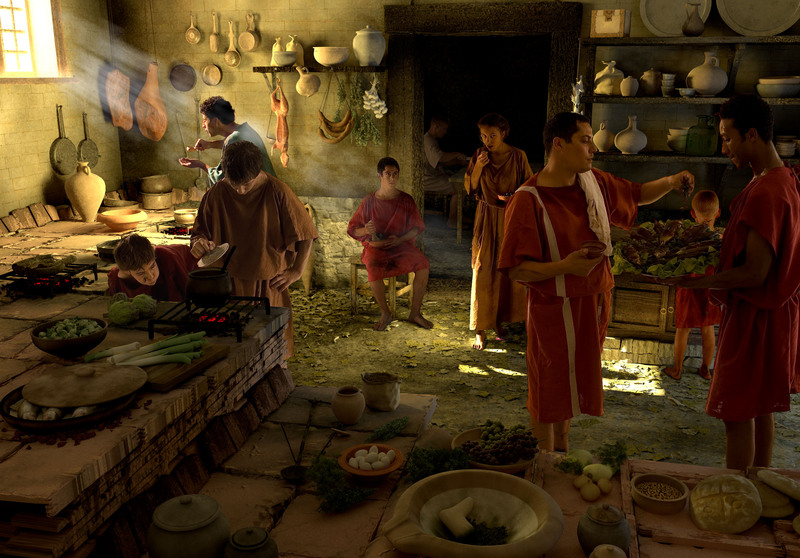 The so-called officer’s kitchen is part of the “Legionary Trail Vindonissa” archaeological park (“Legionärspfad”). The exhibition is accessibly displayed, modern, and worth a visit. See www.legionaerspfad.ch for more details. Thomas Pauli-Gabi, “Ausgrabungen im Gebiet der spätlatènezeitlichen Befestigung von Vindonissa. Ein Vorbericht zu den Ergebnissen der Grabung Römerblick 2002-2004 (V.002.11),” Jahresbericht der Gesellschaft Pro Vindonissa (Jber. GPV) 2004 (2005), 13-39. Thomas Pauli-Gabi, “Vindonissa – Ein Offiziershaus mit grosser Küche, Ausgrabung Römerblick 2002-2004,” in: Zolt Visy (Hrsg. ), Proceedings of the XIXth International Congress of Roman Frontier Studies, Pécs, Hungary, September 2003 (Pécs 2005) 593-606. Most interesting, and I have shared. Very interesting and well done. Thank you!